Way back in 1844, six years before Los Angeles was incorporated and California was given statehood, this modest little adobe structure was built as… well, nobody knows for sure. 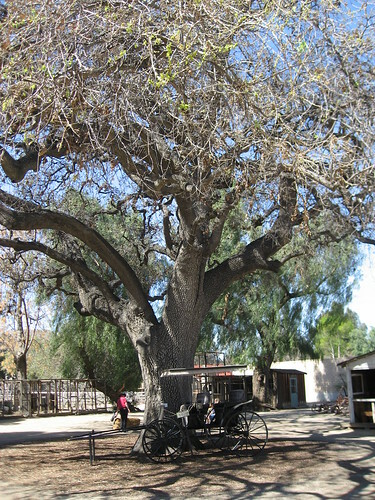 One theory is that it served as a stagecoach stop on the El Camino Real, the King’s Highway connecting California’s missions. If you want to know how adobe bricks are made go here. 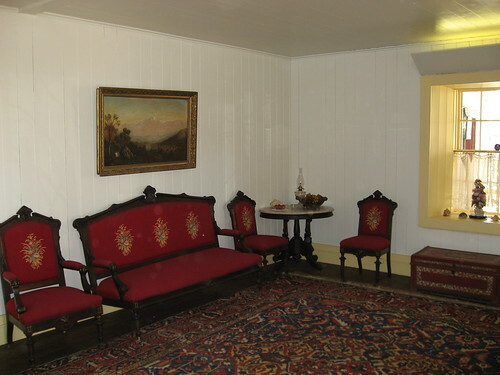 Around 1880, Miguel Leonis and his wife, Espiritu Chijulla, the daughter of a Chumash chief, moved into their adobe abode, enlarging and extensively remodeling the building. Leonis was Basque, born in the French Pyrenees. Once in the U.S., amassing huge wealth from real estate, litigation, and dowry, he came to be known as “El Basquo Grande” and “King of Calabasas” and pretty much ruled a huge chunk of the San Fernando Valley. He died in 1889 from injuries suffered in a wagon accident. In order to inherit the estate, Espiritu had to go to court to prove she was Leonis’s legal wife. She ultimately did, but only a year before her death in 1906. Jumping ahead to August 6, 1962, the first day of the Cultural Heritage Board’s public business, the Leonis Adobe was literally on the verge of being demolished to make way for an adjacent restaurant’s parking lot. Luckily, the board’s first action was to declare the site Historic-Cultural Monument No. 1. Hats off to Kay Beachy, the woman who really led the fight to preserve the landmark. In 1975, the Monterey style mansion was entered on the National Register of Historical Places. 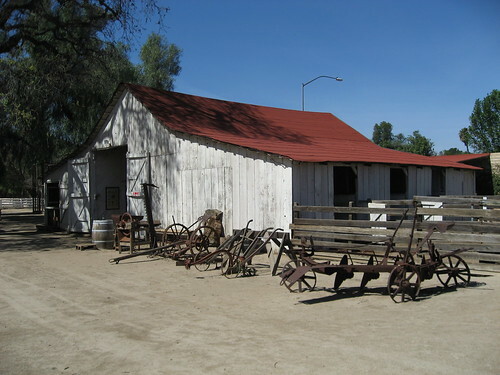 If Miguel Leonis were alive today, he’d certainly ask, “Whose idea was it to put the 101 Freeway in my backyard?” In fact, the barn seen here, built in 1912, had to be moved twice in order to accommodate the 101, which runs just a few feet behind the property. 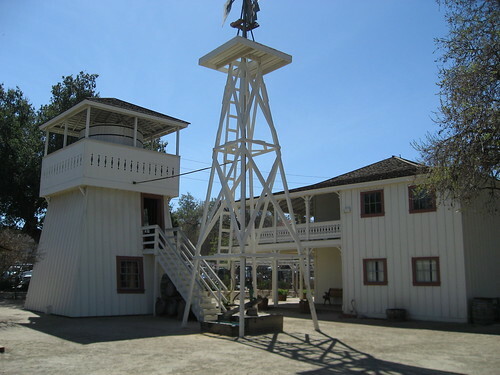 The Tank House, Windmill, and eastside of the mansion. That’s one huge White Oak, and an elderly one at that. Estimated at around 600 years old. 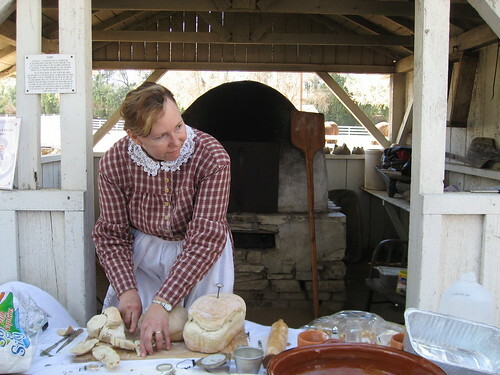 The day I was at the Leonis Adobe, historian Nita Standke had fired up the outdoor beehive oven, baking bread and pies, and lecturing about rancho cooking. One more thing. In the southeast corner of the property sits the Plummer House, a Victorian home built by sea captain Eugene Plummer in the 1870s. 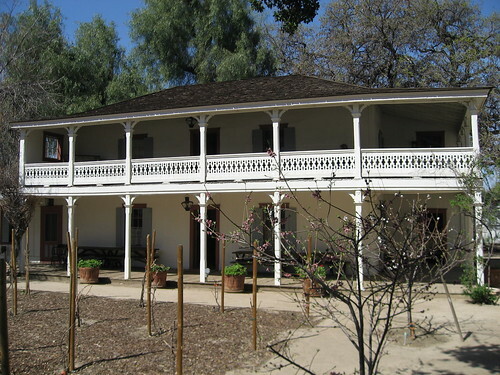 The Leonis Adobe Association moved the home – or most of it – from its original Hollywood location in 1983 after the deteriorated building was threatened with destruction. 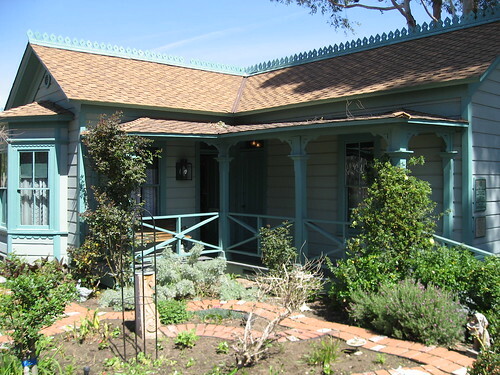 While not a Los Angeles Historic-Cultural Monument, the Plummer House is Historical Landmark No. 160, designated by the California State Park Commissions. It’s now used as a visitor center/museum/gift shop. 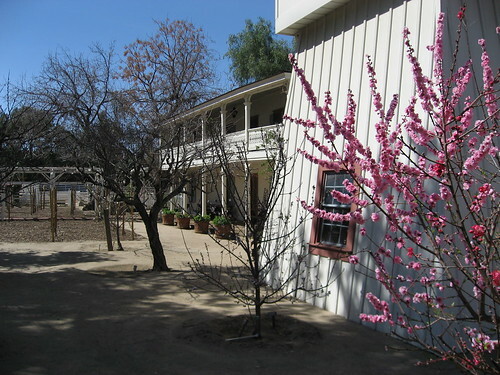 Visit the Leonis Adobe Museum on the Internets. I accidently found your blog yesterday while researching the Dunbar Hotel in downtown Los Angeles. The LA Times published an article about the restoration of the hotel, and I noticed it was on Central Avenue. Then I remembered that the Streamline-Moderne Coco-Cola Bottling Co. building, which I have never seen but want to, was also on Central Avenue. So I looked it up. The Shrine Auditorium was mentioned in my search, so I looked that up too. It was then that I encountered your blog. From your Shrine page, I decided to work backwards all the way to No. 1. I am a fourth-generation Californian, born in Pasadena, raised in Arcadia, educated in Claremont, and settled in Eagle Rock. So, I've always lived within a half-hour radius of my birthplace. You have reminded me of how much I love Los Angeles. I've lived through the earthquakes, the fires, the smog, the traffic, the demolition of great landmarks, and everything else, but it is still a marvelous place to live. After all, you can't beat the weather! LA finally seems to have its act together, saving its history rather than demolishing it. The various trains and subways are a joy to ride. I can't believe I will soon be able to get to Santa Monica WITHOUT a car. The air is so much cleaner than it used to be. I had no idea the Eagle Rock was No. 10. You've inspired me to go and see all the ones I have not seen. Thank you, and now I've got to go to the very end and again work backwards. This has been SO MUCH FUN. Your commentary is great, and I love reading what your readers have to say. What an education. From one history geek to another. Cheers. What a great note. Thanks so much, Joanne.